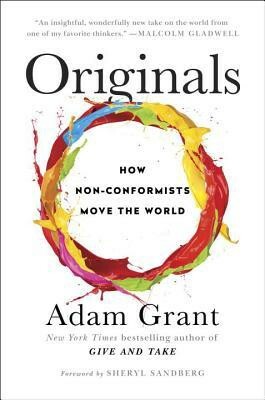 “Originals: How Non-Conformists Change the World” is written by Adam Grant, author of other self-help bestsellers like “Option B” and “Give and Take: A Revolutionary Approach to Success”. His writing is in the same vein as Malcolm Gladwell and Daniel Pink. “Originals” is a book about how we can all become more original. We get to see originality in various contexts and perspectives ranging from organizations to entrepreneurs and from one’s self to leaders. The book starts off by analysing what originality is and is not. We see our popular beliefs about originality get debunked. Common beliefs that entrepreneurs are risk takers, first movers are successful and creativity is the fiefdom of the young are investigated in depth. The author persuades us with anecdotes and hard data that it is not so. The book gets into how to generate and recognize original ideas. We learn that quantity trumps quality in idea generation and that the best judges of originality are our peers. The author then walks us through getting buy in for original ideas from those in power. We get to explore various facets of organizational thinking and why middle management is most likely to be conservative. Next, the book gets into more strategies to develop our original thinking. The following chapter explores power of coalitions in building consensus. The final chapters are a walk through preventing groupthink in organizations and building sustainable cultures that encourage originality. We get to understand the power of emotions and how they can help or hinder us. The last section is a call to action based on the summary of the points covered in the book. Adam Grant starts each chapter with an anecdote or a set of them. He then introduces the core principles of the chapter. And in each section, the anecdote evolves. This style keeps us involved and interested in the topics. In fact, many of the chapters are built like the case studies I had to do when I was in college. In addition, there is a wide variety in the anecdotes as far as context is concerned. “Originals” is written in an engaging manner. This makes it easy to pick up the book, when you have time, and just start reading. The summary section towards the end details out the action items to getting to being original. I would suggest reading the summary first and then reading the full book since Adam Grant has not provided structural context in the book. The book also covers peripheral topics which add to the success of original thinking like recognizing them, selling them and encouraging them. It’s true that the early bird gets the worm, but we can’t forget that the early worm gets caught. A quote by Thomas Jefferson, during the topic on when to speak out. On matters of style, swim with the current. On matters of principle, strand like a rock. A couple of nit-picks about the book. The first is that like most books in this category, “Originals” is WEIRD centric (Western Educated Industrialized Rich Democratic). The second is that the book could have been structured better. I felt that a few topics were revisited in later chapters, without adding value. It might have been better if they had been grouped together. Adam Grant could have explained how these chapters fit together instead of leaving it to the reader to figure it out along the way. I liked the book. Though it does not fall into my ‘classic’ category, the book is still thought provoking. I believe that every person is creative and capable of original. Circumstances makes us tend to get into a rut and we end up foregoing it. This book might be the wake-up call for most of us. From that perspective, I recommend that this book be read.